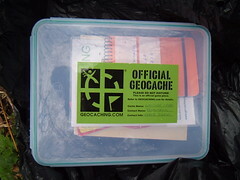 After work last night I got my 13th Cache. I wanted to go for a short walk, and the better half would not be home for some time. I got rained upon. The cache I was seeking was the Lakeside Park Cache. I had been to this Cache before, but had searched in the wrong place as I made a transcription error in one of the clues. I corrected the error and searched again, only to make a new error. For whatever reason the waypoint had been entered in Degrees, Minutes and Seconds rather than Degrees and Minutes.decimal. This meant that I was searching in the wrong place by about 100m. Fortunately I caught the error whilst on site, and made the correction, the cache itself was easy to find once past my stupidity! 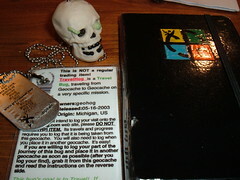 I picked up the Travelhog Travelbug. I don't quite know yet where this will be dropped off.